FREDERICKTOWN — After opening their regular season at home on Tuesday against the Lady Freddies, the Northmor Lady Golden Knights made the bus trip to Fredericktown for game two of the series. Despite a late-inning push, Northmor would drop their second straight contest with the hosts, falling by a final score of 7-4. Fredericktown posted two runs in the home-half of the first to take the early lead. The Knights cut the score to 2-1 after plating a runner in the top of the third, only to see the Freddies tack on a run in the bottom of the frame. Fredericktown would put the game away with three runs in the bottom of the fourth despite Northmor scoring three in the top of the sixth. Megan Adkins took the loss in the circle, pitching the entire six innings and giving up eight hits and seven runs (three earned) while walking one and striking out one. At the dish, Adkins recorded a single and drove in one of the four Northmor runs. The Lady Freddies scored their seven runs on eight hits, committed four errors and stranded six on the base path in the victory while the Lady Knights plated four runs on just three hits, finished with six errors and left 11 runners on base. Other offense for Northmor on Wednesday: Rylee Hollingsworth- 3B, R, 3RBI; Morgan Wiseman- R; Rosie Sklenicka- 2R; Michalea Zeger- 1B, R and Maddie Hoverland- SB. Northmor will pick back up in Knox-Morrow Athletic Conference play, at home, against the Danville Lady Blue Devils on Monday, April 1 before traveling to Danville on Tuesday. MARION — After starting the season at 2-0, the Galion Lady Tigers dropped their second straight meeting with Mid-Ohio Athletic Conference foes, the Pleasant Lady Spartans, on Wednesday by a final score of 9-6. Galion is set to host the Mohawk Lady Warriors of the Northern-10 Athletic Conference for a doubleheader on Saturday, March 30. MOAC play will pick back up for the Lady Tigers on Tuesday, April 2 when they head to Caledonia for a clash with the River Valley Lady Vikings. NORTH ROBINSON — The Colonel Crawford Lady Eagles opened their N-10 schedule on Wednesday by hosting the Upper Sandusky Lady Rams. Unfortunately for the Eagles, they would find themselves on the wrong end of a 19-1 score, falling to 1-2 overall on the season. Crawford is set to head to Crestline on Saturday, March 30 for a non-conference doubleheader against the winless Lady Bulldogs. On Monday, April 1, the Lady Eagles will play host to league foes, the Carey Lady Blue Devils. PLYMOUTH — The trip to Plymouth to square off against the hosting Lady Big Red did not prove to be a fruitful one for the Crestline Lady Bulldogs softball squad as they dropped their third straight game to begin the season 0-3; 10-0. Crestline will now be on their home turf for their next three contests as they host the Colonel Crawford Lady Eagles in a doubleheader on Saturday before welcoming the Lucas Lady Cubs to town for a Mid-Buckeye Conference clash on Monday, April 1. GALION — The Northmor Lady Knights finally got their season underway on Tuesday when they played host to the Fredericktown Lady Freddies. It would not be the start that Northmor was hoping for as they were shutout by their guests in a shortened contest; 11-0. The home team managed just two hits on the day and committed six errors in the field while the Freddies scored their 11 runs on 11 hits, despite stranding six runners on base. Lily Tate and Hollingsworth had the two knocks for the Golden Knights, a double and a single, respectively. Adkins was dealt the loss, going just two innings while allowing six earned runs while walking and striking out a pair. Hollingsworth worked four innings, gave up the remaining three runs and struck out one while walking a hitter. 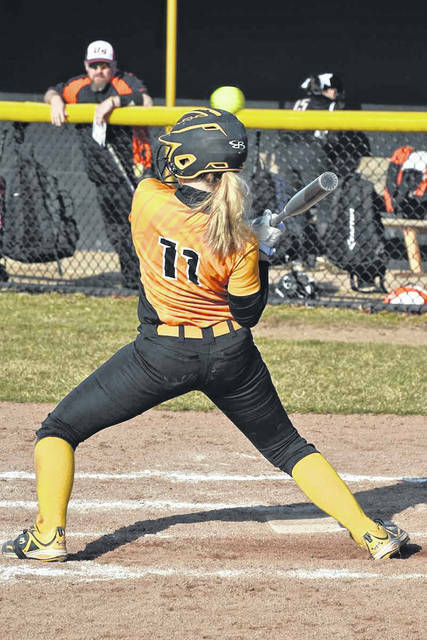 GALION — The Galion Lady Tigers and the Pleasant Lady Spartans found themselves competing in a marathon game on Tuesday as the two squads battled it out for 10 innings before the visiting Spartans eventually claimed the win; 2-1. GREENWICH — After dropping their season opener on Monday to Plymouth, the Lady Eagles softball team traveled to Greenwich for another non-conference meeting, this time against the Lady Trojans of South Central. Crawford would earn the road victory, defeating their hosts by a final tally of 7-5 to give first-year coach Sarah Gray her first victory as the leader of the black and yellow. BUCYRUS — On Tuesday, the Crestline Lady Bulldogs made the short bus trip to Bucyrus for a non-conference meeting with the hosting Lady Redmen. The Lady ‘Dogs would find themselves shutout on the day as Bucyrus claimed the 15-0 victory. Don Tudor | Galion Inquirer The Lady Eagles Hailey Ratliff is brushed back by a pitch high and inside during Wednesday’s meeting with the Upper Sandusky Lady Rams. Crawford couldn’t get the offense going and Upper picked up the road victory; 19-1.
https://www.galioninquirer.com/wp-content/uploads/sites/38/2019/03/web1_Hailey-Ratliff.jpgDon Tudor | Galion Inquirer The Lady Eagles Hailey Ratliff is brushed back by a pitch high and inside during Wednesday’s meeting with the Upper Sandusky Lady Rams. Crawford couldn’t get the offense going and Upper picked up the road victory; 19-1.